Definition at line 28 of file CEvaluationTree.h. Definition at line 35 of file CEvaluationTree.h. Definition at line 129 of file CEvaluationTree.cpp. Definition at line 146 of file CEvaluationTree.cpp. References initObjects(), mInfix, and setInfix(). Definition at line 162 of file CEvaluationTree.cpp. Build the sequence of calculations required to determine the value of the expression. Definition at line 277 of file CEvaluationTree.cpp. 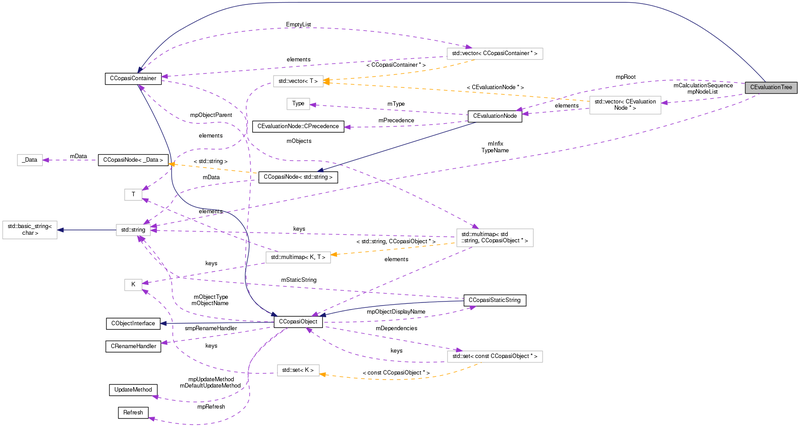 References CEvaluationNode::CONSTANT, CNodeContextIterator< Node, int >::end(), CEvaluationNode::getType(), mCalculationSequence, mpRoot, CNodeContextIterator< Node, int >::next(), CEvaluationNode::NUMBER, CEvaluationNode::OBJECT, and CEvaluationNode::type(). Referenced by CMathExpression::compile(), and compileNodes(). Definition at line 394 of file CEvaluationTree.cpp. References CEvaluationNode::getValue(), mCalculationSequence, mpRoot, and mValue. Referenced by CExpression::calcValue(), CFunction::calcValue(), and CMathExpression::value(). Definition at line 663 of file CEvaluationTree.cpp. References CEvaluationNode::CALL, CCopasiObject::getObjectName(), and mpNodeList. Referenced by CEvaluationNodeCall::calls(), and hasCircularDependency(). Reimplemented in CMathExpression, and CMassAction. Definition at line 263 of file CEvaluationTree.cpp. Referenced by CMathEventN::CTrigger::allocate(), CExpression::CExpression(), CFunction::CFunction(), SBMLImporter::createCFunctionFromFunctionTree(), CCopasiXMLParser::ListOfFunctionsElement::end(), SBMLImporter::importFunctionDefinitions(), CCopasiRootContainer::initializeChildren(), CFunctionDB::load(), FunctionWidget1::saveToFunction(), CReaction::setFunctionFromExpressionTree(), FunctionWidget1::slotFcnDescriptionChanged(), CFunction::splitFunction(), test000058::test_bug1025_10(), test000058::test_bug1025_5(), test000059::test_unique_id_17(), test000059::test_unique_id_18(), test000059::test_unique_id_19(), test000059::test_unique_id_20(), test000059::test_unique_id_21(), and test000059::test_unique_id_21_2(). Definition at line 297 of file CEvaluationTree.cpp. References CCopasiObject::addDirectDependency(), buildCalculationSequence(), CEvaluationNode::CALL, CCopasiObject::clearDirectDependencies(), CEvaluationNode::compile(), CNodeContextIterator< Node, int >::end(), CCopasiMessage::ERROR, Expression, CMathObject::getDataObject(), CCopasiObject::getObjectName(), mCalculationSequence, MCFunction, mErrorPosition, mInfix, mpNodeList, mpRoot, mType, mUsable, CNodeContextIterator< Node, int >::next(), and CEvaluationNode::OBJECT. Referenced by CExpression::compile(), compile(), and CFunction::setInfix(). 308 // The compile order must be child first. Copy an EvaluationTree of the specified type. Note: the returned object has to be released after use with delete. Definition at line 98 of file CEvaluationTree.cpp. References Expression, fatalError, Function, getType(), MassAction, PreDefined, and UserDefined. Create an EvaluationTree of the specified type. Note: the returned object has to be released after use with delete. Definition at line 62 of file CEvaluationTree.cpp. References Expression, fatalError, Function, MassAction, PreDefined, setType(), and UserDefined. Referenced by SBMLImporter::createExpressionFromFunction(), SBMLImporter::importEvent(), and CCopasiXMLParser::FunctionElement::start(). Definition at line 648 of file CEvaluationTree.cpp. Converts an SBML ASTNode to the corresponding CEvaluationNode tree. Definition at line 472 of file CEvaluationTree.cpp. References CNodeContextIterator< Node, Context >::context(), CNodeContextIterator< Node, Context >::end(), CCopasiMessage::EXCEPTION, CEvaluationNodeNumber::fromAST(), CEvaluationNodeDelay::fromAST(), CEvaluationNodeConstant::fromAST(), CEvaluationNodeChoice::fromAST(), CEvaluationNodeObject::fromAST(), CEvaluationNodeCall::fromAST(), CEvaluationNodeOperator::fromAST(), CEvaluationNodeLogical::fromAST(), CEvaluationNodeFunction::fromAST(), MCMathML, CNodeContextIterator< Node, Context >::next(), and CNodeContextIterator< Node, Context >::parentContextPtr(). Referenced by create_normalform(), create_simplified_normalform(), SBMLImporter::createCReactionFromReaction(), and setTree(). Retrieve the list of deleted objects. Definition at line 626 of file CEvaluationTree.cpp. Referenced by FunctionWidget1::leave(), CQFunctionDM::removeRows(), and FunctionWidget1::slotBtnDelete(). Retrieve the position of the error in the string description. std::string::npos indicates no error. Definition at line 196 of file CEvaluationTree.cpp. Definition at line 188 of file CEvaluationTree.cpp. Referenced by CMathEvent::calculateDelayedTime(), CModelEntity::compile(), CMathEvent::compile(), CMathObject::compileFlux(), CMetab::compileInitialValueDependencies(), CModelAdd::copyDelayExpression(), CModelAdd::copyEventAssignmentExpression(), CModelAdd::copyExpression(), FunctionWidget1::copyFunctionContentsToFunction(), CModelAdd::copyInitialExpression(), CModelAdd::copyTriggerExpression(), CSBMLExporter::createEvent(), CQFunctionDM::data(), COptProblem::elevateChildren(), CSBMLExporter::exportEventAssignments(), CEvent::getDelayExpression(), CEventAssignment::getExpression(), CModelEntity::getExpression(), CReactionInterface::getFunctionDescription(), CModelParameter::getInitialExpression(), CModelEntity::getInitialExpression(), CEvent::getPriorityExpression(), CEvent::getTriggerExpression(), COptProblem::initialize(), FunctionWidget1::loadFromFunction(), CNormalTranslation::normAndSimplifyReptdly(), operator<<(), CMetab::refreshInitialConcentration(), CModelEntity::refreshInitialValue(), CCopasiXML::saveFunctionList(), CEvent::setDelayExpression(), CEventAssignment::setExpression(), CEvent::setPriorityExpression(), CEvent::setTriggerExpression(), and test_depth_first_iterator::test_dfi(). Definition at line 199 of file CEvaluationTree.cpp. Referenced by CSBMLExporter::checkForUnsupportedObjectReferences(), CFunction::completeFunctionList(), CModelAdd::copyDelayExpression(), CModelAdd::copyEventAssignmentExpression(), CModelAdd::copyExpression(), CModelAdd::copyInitialExpression(), CModelAdd::copyTriggerExpression(), CExpression::createInitialExpression(), CODEExporter::exportExpression(), CModelExpansion::expressionContainsObject(), CFindDimensions::findDimension(), CODEExporter::isModelEntityExpressionODEExporterCompatible(), CModelMerging::mergeInExpression(), CModelExpansion::replaceInExpression(), and CModelExpansion::updateExpression(). Definition at line 610 of file CEvaluationTree.cpp. Referenced by CMathEventN::CTrigger::allocate(), SBMLImporter::applyStoichiometricExpressions(), SBMLImporter::areEqualFunctions(), CSBMLExporter::checkForPiecewiseFunctions(), CSBMLExporter::checkForUnsupportedFunctionCalls(), CFunctionAnalyzer::checkKineticFunction(), CMathExpression::CMathExpression(), CMathEventN::CTrigger::compile(), CMathTrigger::compile(), CMathTrigger::compileFUNCTION(), CMathExpression::copy(), CMathContainer::copyBranch(), SBMLImporter::createCFunctionFromFunctionTree(), SBMLImporter::createCReactionFromReaction(), CMathContainer::createDiscontinuityEvents(), CSBMLExporter::createEvent(), SBMLImporter::createExpressionFromFunction(), CSBMLExporter::createInitialAssignment(), CSBMLExporter::createRule(), CFunctionAnalyzer::evaluateNode(), expand_function_call(), CSBMLExporter::exportEventAssignments(), CODEExporter::exportKineticFunction(), CODEExporterC::exportKineticFunctionGroup(), CODEExporter::exportModelEntityExpression(), CODEExporter::exportModelValuesExpressions(), CODEExporterC::exportSingleFunction(), CODEExporter::exportSingleFunction(), SBMLImporter::findCorrespondingFunction(), SBMLImporter::findFunctionCalls(), CODEExporter::findFunctionsCalls(), CODEExporterBM::getDisplayExpressionString(), CODEExporterXPPAUT::getDisplayExpressionString(), CODEExporterC::getDisplayExpressionString(), CODEExporterBM::getDisplayFunctionString(), CODEExporterXPPAUT::getDisplayFunctionString(), SBMLImporter::importEvent(), SBMLImporter::importInitialAssignments(), SBMLImporter::importRuleForModelEntity(), SBMLImporter::isConstantFlux(), CSBMLExporter::isEventAssignmentSBMLCompatible(), CSBMLExporter::isEventSBMLCompatible(), CSBMLExporter::isExpressionSBMLCompatible(), SBMLImporter::isMassAction(), SBMLImporter::isMassActionFunction(), CSBMLExporter::isModelSBMLCompatible(), CMathObject::isPrerequisiteForContext(), CODEExporter::modifyTreeForMassAction(), stress_test::normalizeFunctionDB(), CNormalTranslation::normAndSimplifyReptdly(), operator<<(), CSBMLExporter::orderRules(), CODEExporterC::preprocess(), SBMLImporter::removeUnusedFunctions(), CODEExporterC::setExportNameOfFunction(), CReaction::setFunctionFromExpressionTree(), test_depth_first_iterator::test_dfi(), test000082::test_import_delayAssignment_1(), test000082::test_import_delayAssignment_2(), test000082::test_import_delayAssignment_3(), test000082::test_import_delayAssignment_4(), test000082::test_import_delayAssignment_5(), test000082::test_import_delayAssignment_6(), test000082::test_import_delayAssignment_7(), test000082::test_import_delayAssignment_8(), test000064::test_import_event_assignment_expression_and_hasOnlySubstanceUnits_1(), test000064::test_import_event_assignment_expression_and_hasOnlySubstanceUnits_2(), test000064::test_import_event_assignment_expression_and_hasOnlySubstanceUnits_3(), test000064::test_import_event_assignment_expression_and_hasOnlySubstanceUnits_4(), test000064::test_import_event_assignment_expression_and_hasOnlySubstanceUnits_5(), test000064::test_import_event_assignment_expression_and_hasOnlySubstanceUnits_6(), test000064::test_import_event_assignment_expression_and_hasOnlySubstanceUnits_7(), test000064::test_import_event_assignment_expression_and_hasOnlySubstanceUnits_8(), test000095::test_import_l3_event_1(), test000095::test_import_l3_event_2(), test000095::test_import_l3_event_3(), test000095::test_import_l3_event_4(), test000095::test_import_l3_event_5(), test000078::test_l2v4_import_unordered_functions(), test000087::test_simulate_reaction_flux_reference_1(), test_biomodels217_expression::test_term_den1(), test_biomodels217_expression::test_term_den12(), test_biomodels217_expression::test_term_den123(), test_biomodels217_expression::test_term_den1234(), test_biomodels217_expression::test_term_den12345(), test_biomodels217_expression::test_term_den123456(), test_biomodels217_expression::test_term_den1234567(), test_biomodels217_expression::test_term_den2(), test_biomodels217_expression::test_term_den3(), test_biomodels217_expression::test_term_den3456(), test_biomodels217_expression::test_term_den346(), test_biomodels217_expression::test_term_den356(), test_biomodels217_expression::test_term_den36(), test_biomodels217_expression::test_term_den4(), test_biomodels217_expression::test_term_den456(), test_biomodels217_expression::test_term_den5(), test_biomodels217_expression::test_term_den56(), test_biomodels217_expression::test_term_den6(), test_biomodels217_expression::test_term_den67(), test_biomodels217_expression::test_term_den7(), test_biomodels217_expression::test_term_num1(), test_biomodels217_expression::test_term_num2(), test_biomodels217_expression::test_term_num3(), test_biomodels217_expression::test_term_num4(), test_biomodels217_expression::test_term_num5(), test_biomodels217_expression::test_term_num6(), test_biomodels217_expression::test_term_num7(), and CModelParameter::updateModel(). Definition at line 605 of file CEvaluationTree.cpp. Definition at line 167 of file CEvaluationTree.cpp. Referenced by CMathExpression::CMathExpression(), copy(), SBMLImporter::createCFunctionFromFunctionDefinition(), SBMLImporter::createCReactionFromReaction(), CSBMLExporter::createKineticExpression(), CKinFunction::createParameters(), CQFunctionDM::data(), CODEExporter::exportKineticFunction(), CODEExporterC::exportKineticFunctionGroup(), CODEExporterC::exportSingleFunction(), CODEExporter::findFunctionsCalls(), CQFunctionDM::isFunctionReadOnly(), SBMLImporter::isMassAction(), CODEExporterC::KineticFunction2ODEmember(), CQTabWidget::load(), CFunctionDB::load(), FunctionWidget1::loadFromFunction(), main(), CODEExporter::modifyTreeForMassAction(), CODEExporterC::preprocess(), SBMLImporter::restoreFunctionDB(), CCopasiXML::saveFunctionList(), CODEExporterC::setExportNameOfFunction(), and test000080::test_mass_action_recognition_bug(). Retrieve the index to the value of the named variable. Definition at line 207 of file CEvaluationTree.cpp. Definition at line 210 of file CEvaluationTree.cpp. Check whether the the tree has circular dependencies. Definition at line 641 of file CEvaluationTree.cpp. Check whether tree may introduce discontinuities. Definition at line 688 of file CEvaluationTree.cpp. References CEvaluationNode::CALL, CEvaluationNodeFunction::CEIL, CEvaluationNode::CHOICE, CEvaluationNodeCall::EXPRESSION, CEvaluationNodeFunction::FLOOR, CEvaluationNodeCall::FUNCTION, CEvaluationNode::FUNCTION, CEvaluationNodeChoice::IF, CEvaluationNodeOperator::MODULUS, mpNodeList, and CEvaluationNode::OPERATOR. 704 // We found a discontinuity. 711 // If the called tree has a discontinuity so do we. Definition at line 615 of file CEvaluationTree.cpp. References CCopasiContainer::addObjectReference(), mValue, CCopasiObject::setDirectDependencies(), and CCopasiObject::ValueDbl. Check whether this function evaluates to a boolean value. Definition at line 269 of file CEvaluationTree.cpp. Referenced by CEvaluationNodeCall::isBoolean(), and CExpression::setIsBoolean(). Definition at line 266 of file CEvaluationTree.cpp. Referenced by CModelEntity::compile(), CMetab::compileInitialValueDependencies(), and FunctionWidget1::loadFromFunction(). Definition at line 191 of file CEvaluationTree.cpp. Definition at line 216 of file CEvaluationTree.cpp. References CCopasiMessage::ERROR, CEvaluationParserBase::freeNodeList(), CEvaluationParserBase::getErrorPosition(), CEvaluationParserBase::getNodeList(), CEvaluationParserBase::getRootNode(), hasCircularDependency(), MassAction, MCFunction, mErrorPosition, mInfix, mpNodeList, mpRoot, mType, and CEvaluationParserBase::yyparse(). Reimplemented in CMassAction, CExpression, and CFunction. Definition at line 175 of file CEvaluationTree.cpp. References mInfix, mUsable, and parse(). Referenced by CEvaluationTree(), CSBMLExporter::createEvent(), CSBMLExporter::createRule(), CSBMLExporter::exportEventAssignments(), CNormalTranslation::normAndSimplifyReptdly(), CQFunctionDM::setData(), CExpression::setInfix(), CFunction::setInfix(), test_depth_first_iterator::test_dfi(), test_biomodels217_expression::test_term_den1(), test_biomodels217_expression::test_term_den12(), test_biomodels217_expression::test_term_den123(), test_biomodels217_expression::test_term_den1234(), test_biomodels217_expression::test_term_den12345(), test_biomodels217_expression::test_term_den123456(), test_biomodels217_expression::test_term_den1234567(), test_biomodels217_expression::test_term_den2(), test_biomodels217_expression::test_term_den3(), test_biomodels217_expression::test_term_den3456(), test_biomodels217_expression::test_term_den346(), test_biomodels217_expression::test_term_den356(), test_biomodels217_expression::test_term_den36(), test_biomodels217_expression::test_term_den4(), test_biomodels217_expression::test_term_den456(), test_biomodels217_expression::test_term_den5(), test_biomodels217_expression::test_term_den56(), test_biomodels217_expression::test_term_den6(), test_biomodels217_expression::test_term_den67(), test_biomodels217_expression::test_term_den7(), test_biomodels217_expression::test_term_num1(), test_biomodels217_expression::test_term_num2(), test_biomodels217_expression::test_term_num3(), test_biomodels217_expression::test_term_num4(), test_biomodels217_expression::test_term_num5(), test_biomodels217_expression::test_term_num6(), and test_biomodels217_expression::test_term_num7(). Definition at line 422 of file CEvaluationTree.cpp. References CEvaluationParserBase::freeNodeList(), CCopasiNode< _Data >::getParent(), mpNodeList, mpRoot, and updateTree(). Referenced by CMathTrigger::compile(), CMathTrigger::compileGE(), CMathTrigger::compileGT(), CMathTrigger::compileLE(), CMathTrigger::compileLT(), SBMLImporter::createCFunctionFromFunctionTree(), CFunction::createCopy(), SBMLImporter::createCReactionFromReaction(), SBMLImporter::createExpressionFromFunction(), SBMLImporter::importEvent(), SBMLImporter::importInitialAssignments(), SBMLImporter::importRuleForModelEntity(), CReaction::setFunctionFromExpressionTree(), CMathExpression::setRoot(), setTree(), CFunction::splitFunction(), and test000055::test_bug1004(). Sets the complete tree from an SBML ASTNode. Definition at line 467 of file CEvaluationTree.cpp. Referenced by SBMLImporter::applyStoichiometricExpressions(), SBMLImporter::createCFunctionFromFunctionTree(), SBMLImporter::importEvent(), SBMLImporter::importInitialAssignments(), and SBMLImporter::importRuleForModelEntity(). Definition at line 170 of file CEvaluationTree.cpp. Referenced by create(), and CFunction::load(). Converts a CEvaluationTree to an ASTNode based tree. ASTNode* root node of the tree. Definition at line 636 of file CEvaluationTree.cpp. Definition at line 438 of file CEvaluationTree.cpp. References CEvaluationNode::buildInfix(), CEvaluationParserBase::freeNodeList(), mInfix, mpNodeList, and mpRoot. Referenced by CMathExpression::compile(), CModelAdd::copyDelayExpression(), CModelAdd::copyEventAssignmentExpression(), CModelAdd::copyExpression(), CModelAdd::copyInitialExpression(), CModelAdd::copyTriggerExpression(), SBMLImporter::createCFunctionFromFunctionTree(), CExpression::createInitialExpression(), CModelMerging::mergeInExpression(), and setRoot(). Definition at line 332 of file CEvaluationTree.h. Referenced by buildCalculationSequence(), calculate(), CMathExpression::compile(), and compileNodes(). The error position in case the compilation fails. std::string::npos indicates no error. Definition at line 311 of file CEvaluationTree.h. Referenced by compileNodes(), getErrorPosition(), and parse(). Definition at line 299 of file CEvaluationTree.h. 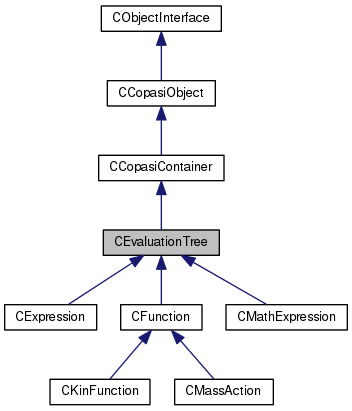 Referenced by CEvaluationTree(), CExpression::compile(), CMathExpression::compile(), compileNodes(), CMathExpression::convertToInitialExpression(), getInfix(), CFunction::initVariables(), operator==(), parse(), setInfix(), CExpression::updateInfix(), and updateTree(). A vector of nodes containing the result of parse. Definition at line 317 of file CEvaluationTree.h. Referenced by calls(), CMathExpression::compile(), compileNodes(), CMathExpression::convertToInitialExpression(), CKinFunction::createParameters(), dependsOnTree(), getNodeList(), hasDiscontinuity(), CFunction::initVariables(), parse(), CExpression::setInfix(), CFunction::setInfix(), setRoot(), CExpression::updateInfix(), updateTree(), and ~CEvaluationTree(). The root node of the tree. Definition at line 322 of file CEvaluationTree.h. Referenced by buildCalculationSequence(), calculate(), CMathExpression::CMathExpression(), CExpression::compile(), compileNodes(), CMathExpression::convertToInitialExpression(), CFunction::createCopy(), CKinFunction::createParameters(), CExpression::getBerkeleyMadonnaString(), CExpression::getCCodeString(), getRoot(), CExpression::getXPPString(), isBoolean(), parse(), CExpression::setInfix(), setRoot(), CFunction::splitFunction(), toAST(), CExpression::updateInfix(), updateTree(), CExpression::writeMathML(), and CFunction::writeMathML(). Definition at line 287 of file CEvaluationTree.h. Referenced by compileNodes(), getType(), operator==(), parse(), and setType(). Definition at line 304 of file CEvaluationTree.h. Referenced by CMassAction::compile(), CMathExpression::compile(), compileNodes(), isUsable(), and setInfix(). Definition at line 327 of file CEvaluationTree.h. Referenced by calculate(), CMassAction::calcValue(), CExpression::calcValue(), CFunction::calcValue(), initObjects(), and CMathExpression::value(). Definition at line 48 of file CEvaluationTree.h. Definition at line 53 of file CEvaluationTree.h. Referenced by CCopasiXML::saveFunctionList(), and CCopasiXMLParser::FunctionElement::start().